"Me and my Gal." 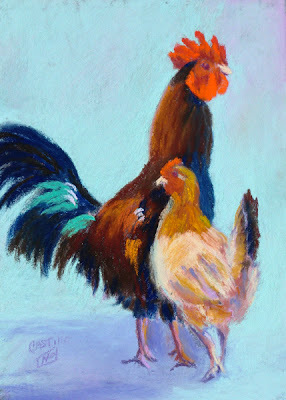 Painting of Farm Street chickens in Bastrop by Jo Knoblach Castillo. Inset photo below: Free-ranging Bastrop chickens. Photo by Terry Hagerty / Bastrop Advertiser. BASTROP, Texas -- Some people complain that their town has gone to the dogs. 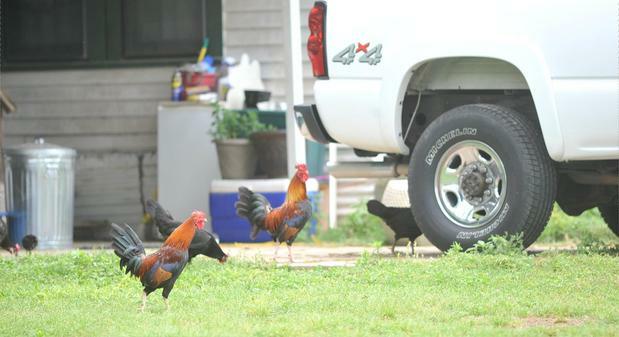 Bastrop, Texas has gone to the chickens -- and Bastropians are proud of it. While other cities might boast of their historic sites or cultural offerings, the good folks of this easy going, free-spirited community near Austin have chosen to highlight a flock of feral chickens that has lived for years on (the appropriately named) Farm Street. No one owns these roosters, hens, and chicks. They take care of themselves, eating bugs and clucking contentedly from yard to yard. Yes, they cross the road for no apparent reason. It's a quirky phenomenon that fits right in with this town of delightfully quirky folks. Three years ago, some of them got the city council to enshrine the quirkiness by designating their area "The Farm Street Historical Chicken Sanctuary." This proclamation provides protected status for the flock. Everyone smiled, the chickens clucked, and all was well. Until this spring, when Beverly Hoskins raised a ruckus in the henhouse, figuratively speaking. As the owner of several rental houses along Farm Street, she wants the council to consider repealing the proclamation, complaining that "a lot of chicken waste" was being spread by the daily promenade. The denizens of Farm Street, however, flocked to defend the fowls, asserting that wild chickens are an integral part of "Bastrop culture." One lady who rents one of Hoskins' houses said of the chickens that roost in a tree in her yard: "I welcome them." Another neighbor pointed out that "Hey, the chickens were here first... And it is 'Farm Street'!" The flock's fate is still up in the air, but the council recently hinted at its sentiments by authorizing some banners on Farm Street telling motorists to slow down. After all, they're driving through a chicken sanctuary. 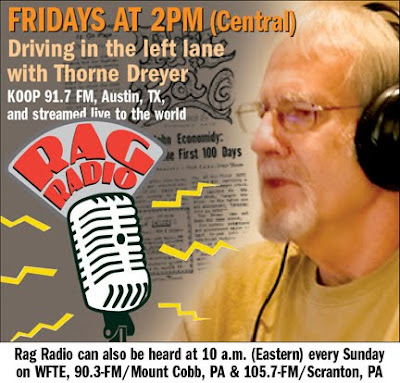 Go here to read "Jim Hightower and the 'Populist Moment'" by Thorne Dreyer on The Rag Blog and to listen to the podcast of our April 6, 2012, hour-long Rag Radio interview with Jim Hightower.